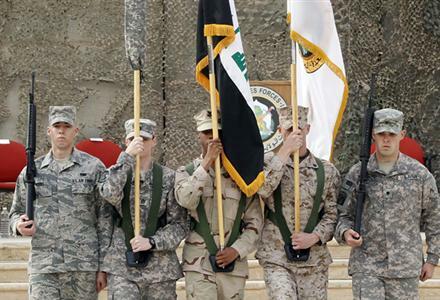 A simple flag ceremony marked the end of a long and expensive war. It all started back in March of 2003. Thousands of lives were lost ( a significantly higher number for Iraqis than Americans), almost 800 billion bucks spent, and people are still unsure why. The original reason given by American leaders at the start of the war was due to weapons of mass destruction. Well almost 9 yrs. later, no wmd have been located. Defense Secretary Panetta and President Obama both insist that the U.S. will still have a presence there to ensure peace and diplomacy in the region. This explaining the 4,000 troops and 2 bases still there until the end of the year. Many Iraqis are happy to see the troops leave their country. Some felt like America was attempting to "occupy Iraq" and failed at that attempt. Others are not so happy to see troops pulling out of a disaster that they helped make. Some Iraqi citizens commented to press yesterday during the flag ceremony about just how unsuccessful the whole ordeal was. "The Americans are leaving behind them a destroyed country. The Americans did not leave modern schools or big factories behind them. Instead, they left thousands of widows and orphans.” said Mariam Khazim according to Nydailynews. This paints a very realistic picture of the trauma this war has caused so many people. In light of this mornings news flashes that both the unemployment rate, and deficit are at their lowest since 2008 & 2009 respectively, the news of the war ending could not come at a better time for President Obama. That makes 3 promises kept as the ride for the 2012 elections slowly approaches. While I celebrate with my President and country at the homecoming of our brave Servicemen and Servicewomen, my heart goes out to the people who lost their lives, limbs, and minds for what many are still calling, a pointless war.